Clinical leaders and world renowned physicians convened to discuss advanced cancer treatments at the Proton Therapy Symposium held at Ahmadi Hospital in Kuwait. The event, sponsored by SAH Global, was held to foster discussion of the clinical effectiveness of Proton Therapy in cancer treatments. Symposium featured speakers included Allan Thornton, MD, Chief Medical Officer, considered to be one the world’s best cancer physicians. Dr. Thornton is known around the world for his leadership in the research and development of proton therapy, and is sought after for his expertise in highly complex clinical cancer cases. Andrew L. Chang, Consulting Director of pediatric radiation oncology, is one of only 5 pediatric proton therapy radiation oncologists in the US. He is regarded as one of the world’s early adopters in proton therapy, having trained at the first clinical proton radiation therapy center in the world at Loma Linda University Medical Center. Attendees at the Symposium included oncologist/hematologists, medical directors, nuclear medicine specialists, nurses, pediatric care providers, case managers and social workers. Together they participated in discussions that featured the clinical effectiveness of proton therapy versus alternative external beam radiotherapeutic approaches, proton applications for a variety of solid and lymphoid tumors and various diagnoses, including those relevant to the pediatric population. 1: Incorporating the appropriate sequence of chemotherapy/surgical/radiological intervention for solid tumors into patients’ proton therapy plans in order to improve outcomes. 2: The assessment and treatment of solid tumors and other malignant diagnoses using novel targeted therapies and proton beam therapy for better patient outcomes and reduction of normal tissue damage. 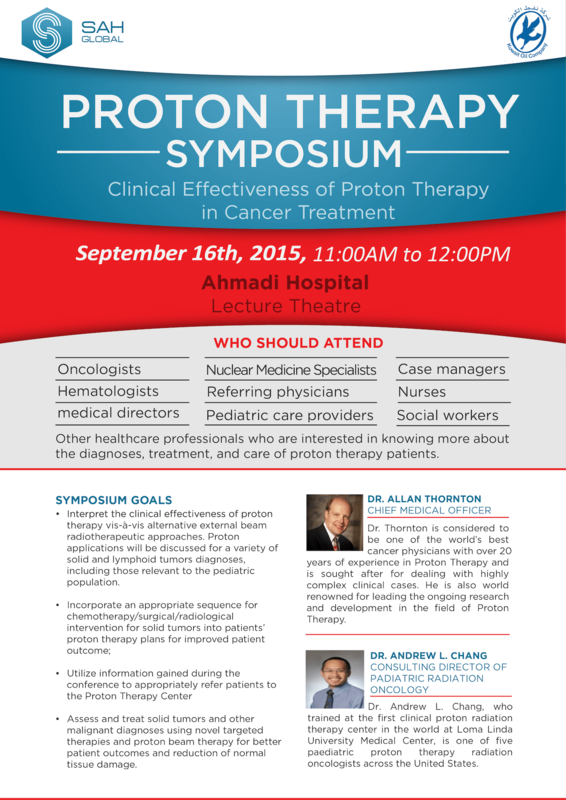 The goal of the symposium is to share knowledge about Proton Therapy within the global clinical community and to increase patient referrals to Proton Therapy treatments in order to improve patient outcomes.